Here’s the latest in a Day in the Life of Teri. This particular day I was off work and Paige spent the night at our place so we could all watch a massive amount of Lost: Season Two together. These pictures were taken during one of our mini-breaks inbetween episodes. 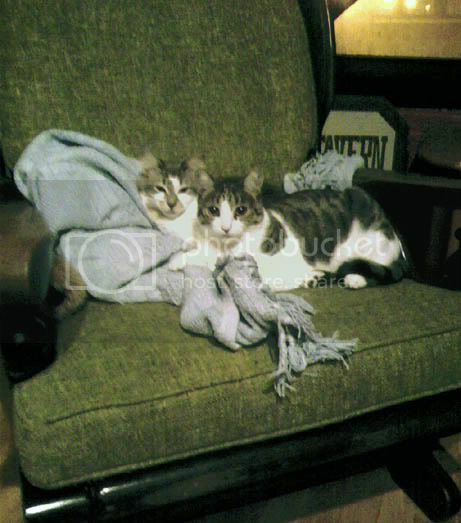 First, here’s one of Cricket and Ashland sitting together in their favorite chair. 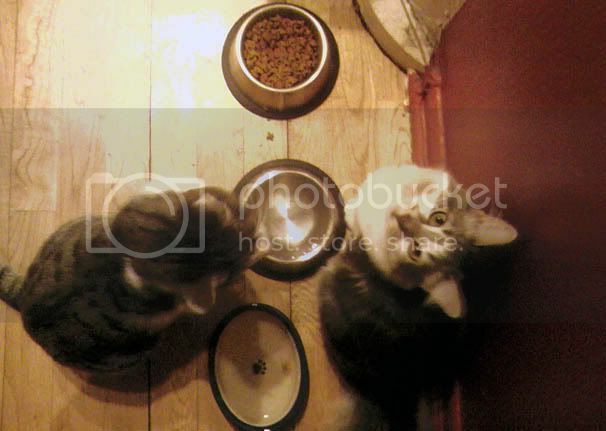 And at their food bowls (Ashland is such a camera diva). 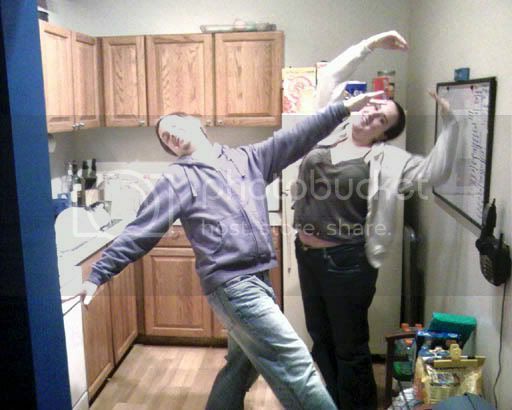 Tim and Paige decided to “bust a move” and prove further that both are incredibly white. Here’s Tim, practicing being suave. This picture makes my heart smile. Trust me, weird feeling. 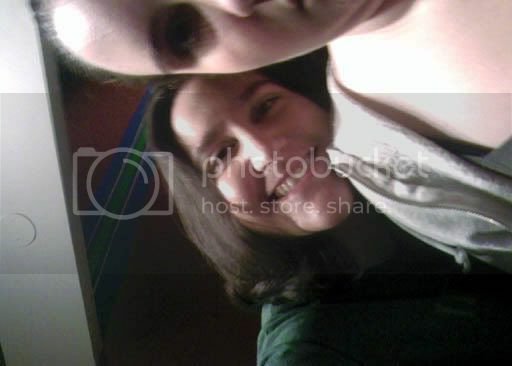 And to prove I was there, I attempted to get a picture of Paige and I together. I’d apologize for my bad aim, but I got all the important stuff in there. Thanks for the pictures! 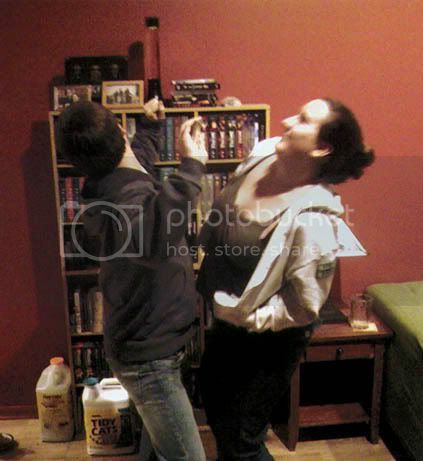 I love pictures. I also love pictures, so thanks! Those are great ones too – they made me smile. Also, the new cat, Cricket, looks a LOT like my cat Merlin. 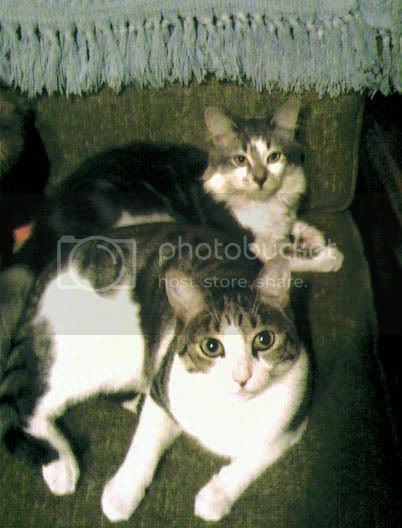 Their markings are almost exactly the same, and they've both got really big eyeballs. I actually call Merlin "my little bugeyed freak". When will you be in town? You said over Thanksgiving? The weekend after Thanksgiving. Friday, the 24th, to Monday, the 27th. I'm excited to see everyone!!! Woot! Anything in particular things you'd like to do? I get in Friday night and Saturday my family is celebrating Thanksgiving, but perhaps Sunday night we could hit the town? Or something slightly hit-the-townish? Awwww. Picture #3 is the cutest. Picture #6 is also cute, but not because of the kitties. Dustin, LONG time no see. We need Shannon to have another party or something, then I'll be able to see you! I've been good–mostly working. How the heck are you? I haven't seen much posting coming from your end lately.